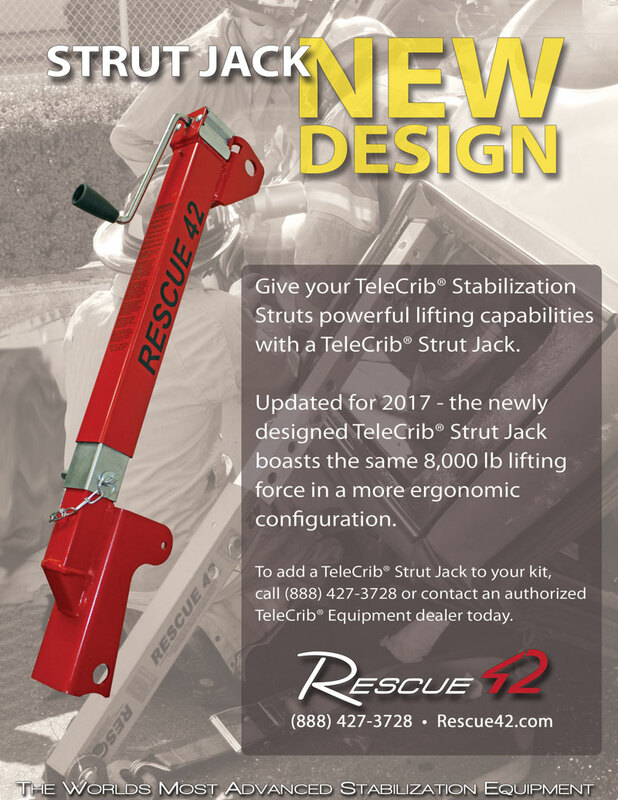 TELECRIB® STRUTS provide the most advanced stabilization available to protect your crew and accident victims during extrication. Designed for Engines/Pumpers, the TeleCrib® Jr Strut and Shark™ Jr Chock are a powerful, yet compact stabilization solution for Fire Due Responders. Secure a vehicle in minutes for basic extrication and patient care. Rescue personnel in the field send us their photos of real accidents and extrications. Available in 2 sizes - the LARGE SHARK™ deploys to 16" for high clearance vehicles, SHARK™ JUNIOR to 12". Both collapse to 5" and nest for compact storage. You can fit 4 SHARKS™ into less space than 2 wood or plastic chocks require. Use our training pictures at your next training class. All pictures can be downloaded for ease of use. View our product and instructional videos. Click below for detailed product information and manuals. Join us at our next event or tradeshow. We travel the country to meet with you – our customers to find out how Rescue 42 can serve you better. Have a question that you need answered check out our FAQ’s. If you don’t see your question answered fill out the form at the bottom of the page. Get materials and information that can help you at your next training session. Do you need product information? Need a question answered? Want to schedule a demo? Send us a message and we will get back to you ASAP. Rescue 42’s commitment to innovation ensures that our customers have the most technologically advanced tools to support their extrication challenges. With vehicle crashes on the rise, extrication has become one of the most frequent calls in the fire service. Rescue 42 is committed to assisting departments, and their communities, with high quality stabilization tools to support rapid patient extrication and care. You will also find an extensive library of extrication stabilization training resources on the website and social media outlets to integrate into your operations. For questions about our tools, stabilization techniques, sales and demos, please contact us at (888) 427-3728 or Sales@rescue42.com. You may also request a free catalog and stabilization DVD by using our online form. We’re here to support you in more ways than one. Extrication needs to be done quickly and properly in order to increase the chances of survival for the crash victims. However, it needs to be done safely so that you, the first responders, will not be in harm’s way. This is why you need the right gear support to properly back up any rescue attempts that you and your crew need to perform on the field. These include vehicle stabilization struts, rescue struts and vehicle stabilization equipment, among others. Having the right fire and rescue equipment allows you to be able to stabilize the scene in a matter of minutes. This allows you, the rescue operator, to give the victim the best possible chances of survival– no matter how grim the situation. Better yet, durable and reliable equipment keeps you safe. This means you and your team can do your job confidently, knowing that your rescue gear and equipment will not fail you. As a fire and rescue professional, you face the most harrowing situations on a regular basis. And when it comes to saving lives in the most critical of conditions, proper equipment and timing matters in being able to undertake a successful vehicle extrication operation. Here are Rescue 42, Inc., we want to help you do your job better. After all, so many lives are on the line. For any sales questions or inquiries, contact us to learn more or call us at the number above.